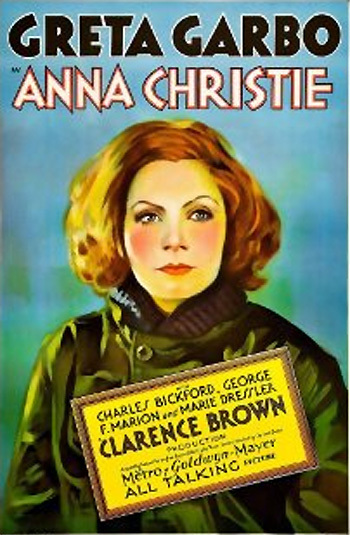 Anna Christie (1930) was advertised, in a two-word ad campaign: "Garbo Talks!" - in "Her First TALKING Picture" (and 14th film) for cinema's greatest silent star - an asexual, supercool Nordic beauty named Greta Garbo. MGM Studios was quite concerned about their alluring, 24 year-old talented actress. She was one of their biggest stars, but she had a potential liability - her untested, heavy Swedish accent. Even after talkies were inaugurated in 1927, Garbo starred in more silents, e.g., The Single Standard (1929) and The Kiss (1929). Many other silent stars had already failed or struggled to make the transition to the sound era - Nita Naldi, Vilma Banky, and John Gilbert (satirized in MGM's Singin' in the Rain (1952)). Finally, the star's first talkie was carefully chosen for her, mostly because it perfectly suited her Swedish accent. And a familiar director Clarence Brown was also assigned to the film, having already directed Garbo in Flesh and the Devil (1926), and A Woman of Affairs (1928) (and later Anna Karenina (1935) and Conquest (1937)). The role Garbo would play, a sickly prostitute, would be in sharp contrast to the glamorous characters she had already played in silent films. The 74 minute, black and white Anna Christie was adapted (by influential screenwriter Frances Marion) from Eugene O'Neill's play of the same name. It had earlier been a stage play, and had been filmed by producer Thomas H. Ince and director John Griffith Wray as a silent picture in 1923, with Blanche Sweet as the heroine, and George F. Marion in the same role that he played onstage (and in this version). In 1984, a film directed by Sidney Lumet, titled Garbo Talks (1984), used this film's slogan in a story about a woman whose dying wish was to meet her screen idol Garbo. In the famed, immortalized scene that is about sixteen minutes into this over-rated and stagy drama, weary and ailing, man-hating Swedish-American streetwalker Anna Gustafson Christie (Greta Garbo), searching for her estranged barge captain father Chris Gustafson (George F. Marion) to seek redemption, makes her grand entrance into a NY Battery waterfront saloon from a foggy street. The bar's waiter holds open the door to the Ladies Entrance as she struggles in, lugging an old, weighty suitcase. She shuffles over to a wooden table across from where her father's boozing companion Marthy (Marie Dressler) sits, and drops her suitcase onto the floor. Anna takes a seat in a chair, crouches down, and finally delivers her famous opening lines. Anna: Gimme a whiskey, ginger ale on the side. And don't be stingy, baby! Waiter: (sarcastically) Well, shall I serve it in a pail? Anna: (bluntly) Ah, that suits me down to the ground. (After the whiskey is served and downed) Gee, I needed that bad all right, all right.